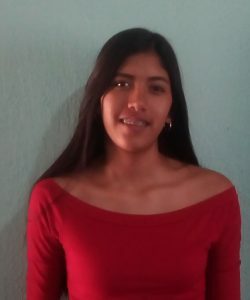 About Cristina Abigail R. C.
Cristina likes to drawing and play football. Her favorite subject at school is Mathematics and her least favorite is Chemistry. Cristina likes to go to school and she has many friends. She is very quiet girl; she helps her family cleaning her home and helps her sibling with their homework. Her favorite sport is football and her favorite character is “Super Man”. Cristina likes to become in a “Business Administrator”. Her dad’s name is Ismael; he died approximately 10 years ago. Her mom’s name is Catalina; she has an elementary school education. She has a good health and she works as a school intendent. Cristina shares her home with her mom, sister and grandparents. Their home has living room, bath, kitchen and two bedrooms with two full beds and one single bed. Their family pays for rent house $120 USD dollars per month.